As an explorer you may not prefer a winding road trip on wheels from Dalhousie to Manali snaking through the mountains. 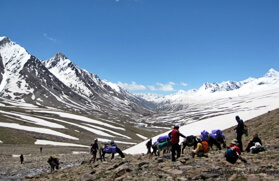 To extract the stunning beauty of Himachal Himalaya and creepy-crawly forest, the trek from Dalhousie to Manali en route to Keylong is one journey that frames every spectacle of nature. From the towering snowcapped mountains, peeking behind the emerald green hills, to the gushing streams that cut through deep gorges, the journey remains boggling and blindsiding at each turn. 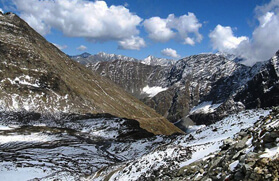 Dalhousie and Manali, both are the grandeurs as hill stations of Himachal Pradesh Tourism, which pulls in thousands of tourists from different parts of the country. 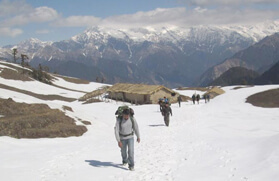 But many may not like the idea of trekking from Dalhousie to Manali. What's the use when you have wheels to steer through the mountains? Some though are up for the challenge and hit the trailing tracks from Dalhousie passing through amazing landscapes and some of the secluded villages that reveals the traditional hues of the Himachalis. The journey further divulges many Buddhist monasteries that reflect a diorama of footsteps of Buddhism. 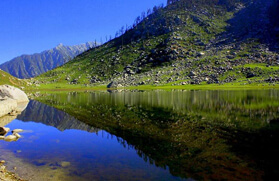 Dalhousie at an elevation of 1,970 meters is an ideal destination to bring forth some rejuvenating days. On the other hand, Manali at an elevation of 2,050 meters is a potpourri of scenic beauty, adventure activities and culture. 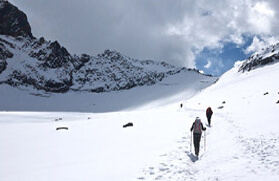 The trek from Dalhousie to Manali via Keylong commences from Bharmour and leads to Keylong at 3,080 meters via Shansha, which is at an elevation of 2,950 meters. From Dalhousie the journey heads to Khajjiar at 1,951 meters, which is roughly 20 kilometers away, and thereafter the route winds to Chamba followed by Bharmour at 2,195 meters via villages like Rakh and Durghat. From Bharmour the actual trail begins through a thick forest and after a moderate climb the journey leads to Hadsar at 2,317 meters. From Hadsar the track snakes along the Budhil stream to Kugti at 2,640 meters and thence to Duggi Caves, which lies at 3,354 meters. 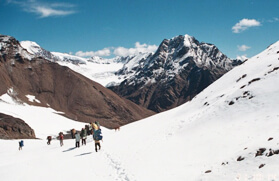 From Duggi there is a steep climb to an altitude of 5,040 meters followed by a steep trek downhill to Alyas at 3,660 meters. 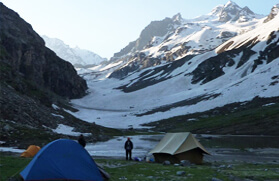 From Alyas the trail continues to Shansha via Khardu and thereafter heads to Keylong and finally to Manali. 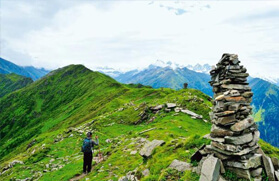 Trek either via Kalatop or direct through thick through thick forest. Descending and having good view of distance mountaining and Ravi valley down below. 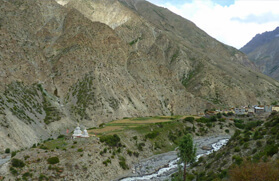 By bus Via rakh, Durghati & other villages, Visit old temples and other building of old capital of Chamba. The rout is along different terrain up and downs through forests. The rout is along the Budhil stream with many ups and downs through green forests. Green valley panoramic view Kartic temple at Keling worth visiting. 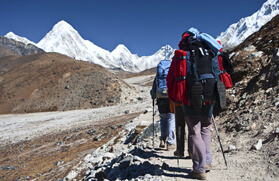 Kailash peak is visible cave is sufficient for4r 15 persons. A steep ascent to pass and then steep descent after the pass. 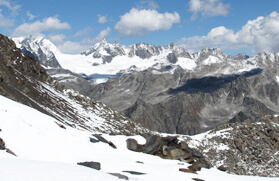 Khardu to Shansha (2950 m.) Distance 14 km. Visit Kardang Monastery and meet tribal people.